Hua Hin Sea is rich in their bounty. This coastline is no more than fifty meters deep; its warm sea is teeming with plankton which provides food for the vast abundance variety and quantity of fish. Visit Hua Hin pier in the morning or evening and watch the fishermen haul out their fresh delights. The fishermen in Hua Hin use fish traps in shallow waters and use boats for netting in the open seas. Their boats are between eighteen to forty-five feet long and without cabins. They link up in clusters for net-fishing at night. Squid are best caught after dark. The fishermen have improved on the catch rate. They attached powerful green lights to the fishing boat, the brilliant green light mimic sunlight and attract plankton and small fish that usually feed in the daytime to the surface. Squid which feed on these organisms follow their food chain into the fishermen’s waiting nets. At daybreak, the Hua Hin city pier is already bustling. The fishermen unloaded their heavily laden catches with glistening fish of every size and shape. The bargain stalls are gleaming; each stall has fresh selection of seafood in their appointed pens: sea bass, pomfret (Pla Chalamet), Pla Sam Lee, Pla Gra Pong, tuna, mackerel, squid, herring, eels, shrimp, prawns, crabs, lobster, oysters, mussels, clams, and horseshoe crabs. The best seafood to eat in Hua Hin is cotton fish or king fish (Pla Sam Lee), perch (Pla Gra Pong), squid, mussels, and crab. Thai Seafood is cooked in variety of culinary glory: steamed, poached, sautéed, grilled, baked, roasted, fried, in spicy curried, in Dom yam with coconut milk, or stuffed, using fresh seasonings such as lemon grass, coriander leaf, and kaffir lime leaf, ginger, garlic, krachai, three kinds of basils and plenty of lime juice and dry spices such as cumin and cloves. A heaping plated of steamed rice forms the centerpiece and the other dishes are to be eaten in any order you prefer with seafood sauce of chilies, garlic, lime juice, and nam pla. Locally grown fresh, sweet, and juicy pineapple is perfect as a dessert. Dried squid, shrimp and fried tod man pla (fish cake) also make tasty snacks supplied by street vendors and sidewalk food shops. They can be enjoyed while lounging by the beach or strolling on the seashore. This simple fare is best washed down with cold beer or iced fruit drink. 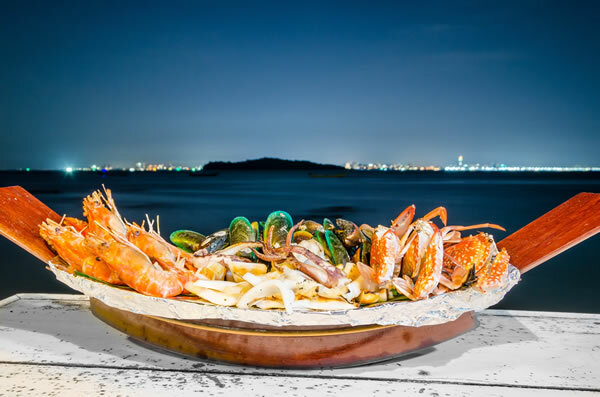 The concentration of popular seafood restaurants line the waterfront alongside of Hua Hin pier, where piping hot dishes of fresh crabs, fish, prawns and squid are served on outdoor decks stretching over the water. Anyone who has experienced Thai seafood will readily agree to the Thai obsession with bold, intense flavors of taste and smell. A secret of delicious seafood lies in its freshness and Hua Hin Sea provide veritable of the sumptuous ingredient to the Thai, Western, or Eastern style seafood recipe that will satisfy all palates, whether you are a culinary connoisseur or just an ordinary diner. Bon Appetite.